My inquiring mind is inquiring about you. It’s a bit early, but I’m dying to know what kind of New Years Eve person you are. Do you party all night? Go to the movies? Sit inside by the fire? Go to bed by 9? The key word there is champagne, and no matter where I am, it’s always the one thing I really want on New Years. I LOVE bubbly wines and the like. Sweet or dry – I’m a fan of both, but my drug of choice lately has been a dry rosé. And not just because it’s pink. But I mean, partly because of that. Says my unsophisticated palette. Thankfully, gone are the days when I’d choose Arbor Mist over Pinot Gris. For weeks I planned on making a champagne sorbet: one that worked on it’s own or plopped in a sparkly glass of bubbly. And per usual, at the last second I changed my mind. Opting for the wine I’ve been reaching for the most, I am totally thrilled I went with this option. Like I expected with the champagne, this works on it’s own but also dropped in a glass. It’s refreshing and even somewhat palette cleansing, but you obviously must enjoy wine to be on board. Lucky for you, it will work with most versions. On top, I sprinkled a touch of wild rose salt that I bought in Nantucket earlier this summer. It’s not a necessity and was originally placed there for color (SO CRAFTY. not. ), but I also enjoyed the flavor. If you can find a merlot or chardonnay salt, I think that would work well too. But hey! What do I know? I’m just the person who likes to throw weird stuff together and say a little prayer. Pomegranate arils would work well too. Hint Hint. So this will, for sure, be making an appearance when it’s time to ring in 2014. Yes. Seriously. 2014. WHAT!!! That so freaks me out. When I was in elementary school we made a time capsule that is set to be open in 2015 and well… here we are. This is not real life. Combine all ingredients in a saucepan over medium heat. Stir constantly until the sugar dissolves and the mixture is boiling, then remove it from the heat. Let the liquid cool completely, then place it in the fridge to chill for at least 30 minutes. As you can see from the photo above, I like to use a bowl of ice and pour the mixture into a resealable bag to chill before placing it in the fridge. After 30 minutes, add the mixture to your ice cream make and churn according to directions. I use the KitchenAid stand mixer attachment and church for 25 minutes. Once churned, add the sorbet to a freezer safe container and freeze for at least 4 to 6 hours. Serve with a garnish of fresh mint if eating alone, or drop in glasses of champagne or wine. We are going to a White Party for New Years. If you boil the Ròse does that remove the alcohol? Could you just boil the sugar and water make a simple syrup then add the wine, wow I sound like a lush. Can’t be losing any alcohol! Can’t. Stop. Laughing!!!! I’m sure these are fantastic but it just seems that you need to put them in a bigger glass so there’s not that bulge on the top. 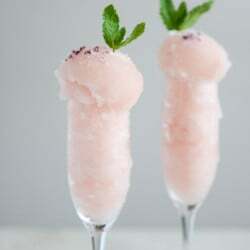 Or just go all out with more rose salt & mint and create a bachelorette party drinking/brain freeze game. This looks amazing! Would be super refreshing for summer. Can’t wait to give it a go! I was just surfing the web for edible flowers recipes and found your rose sorbet. looks great and will try it. We’ve just published our second volume, “Edible Flowers & Leaves” (Amazon) if you’re interested in more recipes. Pingback: 22 Tasty Summertime Treats Made With Wine and Sangria...Prepare Yourself - Viral Posts Ninja! This looks so refreshing & delicous! Rosé is one of our most popular wines during select seasons. Want to be the first to know when a new Rosé is released?